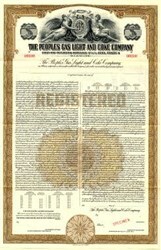 Beautiful engraved specimen certificate from the Peoples Gas Light and Coke Company dated in 1951. This historic document was printed by American Bank Note Company and has an ornate border around it with a vignette of angels next to the company logo. This item is over 76 years old. For 150 years, Peoples Energy has supplied the residents and businesses of Chicago and northeastern Illinois with natural gas service. 1848 A group of prominent citizens apply to the Illinois legislature for incorporation to begin the manufacture of gas for the city's streets and houses. The charter was signed in 1849. 1850 Peoples becomes the first utility in the City of Chicago when it lights the city's streets with natural gas lamps. 1871 Helps city rebuild after the Great Chicago Fire. 1893 Introduction of electricity at the Columbia Exposition. Peoples shifts its business from gas lighting to cooking with natural gas. 1895-1910 12 gas companies merge under the direction of President C.K.G. Billings, Jr. to become the Peoples Gas Light & Coke Co. 1932 Constructs first long distance, high-pressure, steel natural gas pipeline from north Texas to Chicago, allowing for the first time industrial usage of natural gas. 1962 For the first time able to meet all demands by Chicago residents for natural gas to heat their homes, helping to clean up Chicago as its reliance on coal and oil to heat homes diminishes. 1964 Purchases North Shore Natural Gas in Lake County. 1980 Spins off its non-utility companies, exits the pipeline business and changes name to Peoples Energy Corporation. 1998 Begins diversification of business to include areas such as Power Generation, Midstream Services, Retail Energy Services and Oil and Gas Production. Peoples Energy, a member of the S&P 500, is a diversified energy company comprised of four primary business segments: Gas Distribution, Oil and Gas Production, Energy Marketing, and Energy Assets. The Gas Distribution business serves about one million retail customers in Chicago and northeastern Illinois.